Leaving children unattended in a vehicle with the smart key is dangerous. Unattended children mimic adults and they could press the engine start/stop button which would enable children to operate power windows or other controls, or even make the vehicle move, which could result in serious bodily injury or even death. Never leave the keys in your vehicle with unsupervised children. 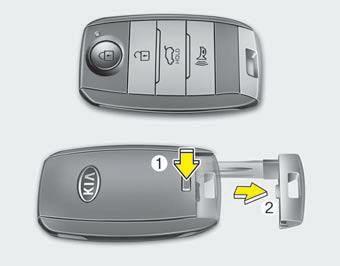 The button will only operate when the smart key is within 28~40 in. (0.7~1m) from the outside door handle. Even though you press the outside door handle button, the doors will not lock and the chime will sound for 3 seconds if any of following occur: - The smart key is in the vehicle. When the smart key is recognized in the area of 28~40 in. 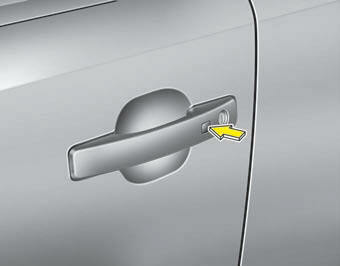 (0.7~1m) from the front outside door handle, other people can also open the doors. You can start the engine without inserting the key. 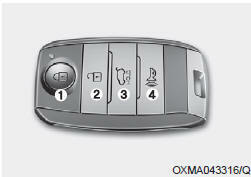 For detailed information refer to the “Engine start/stop button” in chapter 5.